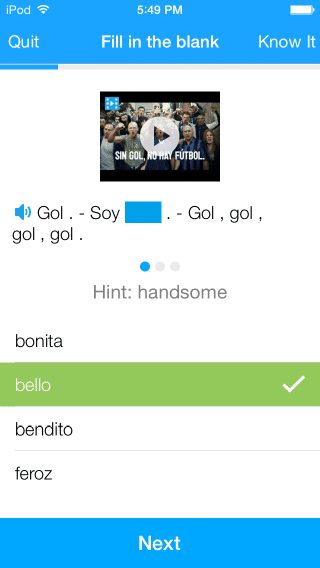 Knowing Spanish gender separates the Spanish language learners from the fluent speakers. If you already speak a Romance language (those that come from Latin), then you will not be confused by this characteristic. If you are used to speaking in neutral terms, be prepared to open a new avenue of perception in your mind. This will change the way you view the world. Getting the hang of Spanish gender can take time, but it is the next big step after getting a handle on the Spanish learning basics, such as learning how to self-teach, making Spanish words plural and knowing where to place accent marks. The following tips regarding Spanish gender will help train your brain to recognize, categorize and eventually produce gender accurately while speaking Spanish. A noun is born: Male or female? When speaking about living creatures, nouns that end in “o” are masculine. When speaking about living creatures, nouns that end in “a” are feminine. There is a slight possibility that you might fall into a “gender thinking trap.” This deception tricks you into thinking that everything associated with a male will automatically be masculine and everything associated with a female will automatically be feminine. This is false. Only distinct living creatures fall under this categorization. The following examples clearly illustrate how objects commonly associated with each gender do not follow the rule. To keep you from falling into this trap, a very important step you can take is to experience and interact with these nouns in real-world situations. How can you do that from home? Through online Spanish immersion with FluentU! 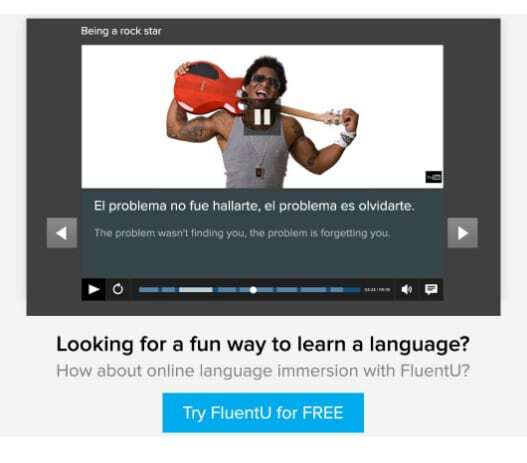 FluentU is a video-based Spanish learning site which helps you learn the language through real-world videos, such as movie trailers, commercials, news and inspiring talks. Just take a look at this very, very small sampling of the video content below. You can get a pretty good idea of the diversity of the content from that little list alone, but I strongly encourage you to click over to the site and take a better look, up close and personal! There are a few different ways you can go about playing (ahem, I mean, “learning”) with FluentU. After choosing an individual video based on your skill level and personal interests, you’ll be prompted to choose between “watch” and “learn” modes. If you opt for “watch,” you’ll watch your videos as normal with interactive subtitles that are translated both by word and by sentence. If you click on “learn,” then you’ll go straight to the personalized flashcard content using key vocabulary from the video, giving you a chance to practice either ahead of time or after watching the clip. This “learn mode” actually integrates pictures, video clips and example sentences into the flashcards, making for truly memorable in-context learning experiences. You can start using FluentU on the website with your computer or tablet or, better yet, download the FluentU app from the iTunes or Google Play store for iOS and Android devices. So, be sure to get in your authentic Spanish practice to really get these genders down. Ready for our last six rules? 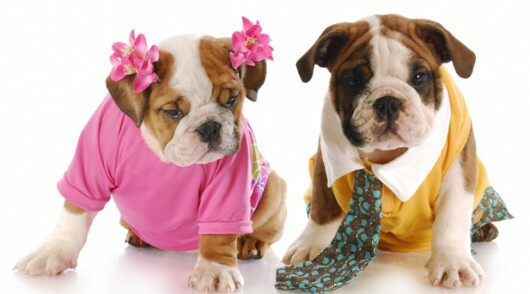 When there is a crowd or a group of people, animals, ideas or things that have a mixed gender, what gender is used? If you answered, “the masculine gender is always used when there is a mixed group,” you are already thinking in the same direction as the Spanish language. When there is a group of mixed gender, no matter what the ratio is of females to males and males to females, the group is always referred to as masculine. The masculine gender has more power than the female gender when it comes to making the rules. Although the words have the same value, the male acts as the default leader. To make the word feminine you simply add the feminine “a” touch. el señor → the Mr. la señora → the Mrs. Some nouns that refer to professions do not change their forms. This does not mean that the importance of gender disappears. If the word does not change, the article is in full charge of specifying gender. 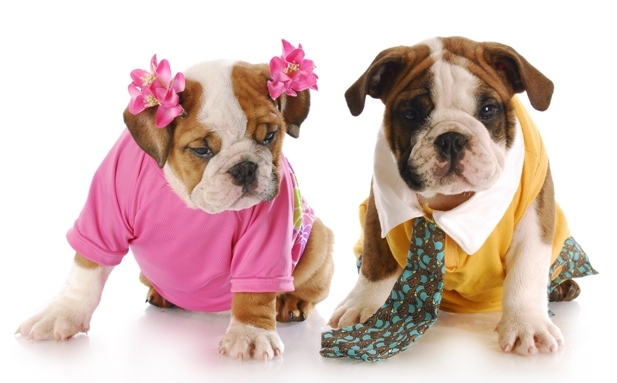 Some nouns that refer to professions have the same form for masculine and feminine. The article is the only thing that changes. Optional brain exercise* Make a list of nouns that currently surround you (wherever you are) in English (you decide on how many you want to attempt). Try to guess their gender in Spanish. Look up the words and see how many you got right and what rules you recognize. Some words are exclusively reserved for female articles and others are exclusively reserved for male ones. These will admit no opposite intervention, ever! The use of masculine articles with exclusively feminine endings and vice-versa will disrupt and distort your communication. Nouns that end in –sión, –ción, –dad, –tud and –umbre will always require the feminine article. Languages exist within a strict framework of rules, yet they are alive, they are dynamic, and the are continuously evolving. Therefore, there are always exceptions to the rules, and these exceptions, in turn, create new rules. Remember, learning a new language is not a result but more of a process! It is important that you set a daily routine for your language learning that excites you and allows you to see results. As it relates to gender, familiarize yourself with the rules. Listen carefully for them when watching your favorite movies. While reading a comic or newspaper, circle the gender agreements that most surprise you. Above all, find someone to practice with! You will quickly catch on to the patterns, nuances and subtleties of the language this way. Think of how small children learn language for the first time. A ton of listening, a lot of gibberish, some clarity with mistakes, increase in vocabulary and finally fluency! As mentioned earlier, FluentU is a fantastic platform of Spanish learning experiences through real-world videos—like music videos, sports games, video blogs and business videos. FluentU is designed to get you comfortable with everyday Spanish, by combining all the benefits of complete immersion and native-level conversations with easy-to-read subtitles. FluentU brings native Spanish videos within reach with interactive captions. Did you miss a word? Just put your cursor on the captions to instantly view definitions and useful examples, while simultaneously pausing the video so you can start again once you’re ready! And FluentU is more than just videos—it’s a complete language learning program. You can learn all the vocabulary in any video with FluentU’s Learn Mode. Swipe left or right in the app to see more examples of the word you’re learning. 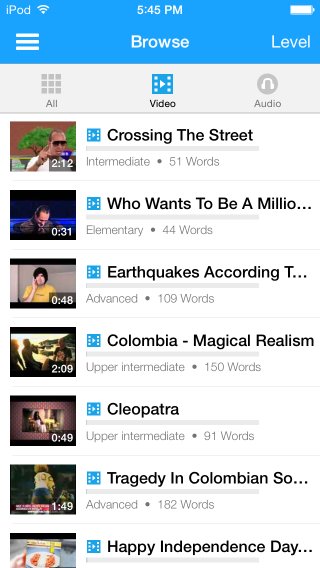 You’ll be able to create vocab lists and track your progress as you advance through video after video. The best part? FluentU keeps track of your vocabulary, and it recommends examples and videos to you, based on the words you’ve already learned. You have a 100% personalized experience. Start using FluentU on the website with your computer or tablet or, better yet, download the FluentU App from the iTunes store.